The Royal Society for Fine Arts will hold an official opening ceremony of the National Gallery Complex in Jabal Weibdeh very soon . The complex, a haven for art activities in Jordan , consists of three areas, namely, a main gallery, an annex building and a Japanese garden which adds an artistic attraction to the Complex with its famous and distinctive style. The idea to establish a Japanese garden was initiated in 2002 by Her Royal Highness Princess Wijdan Ali, President of the Royal Society for Fine Arts. 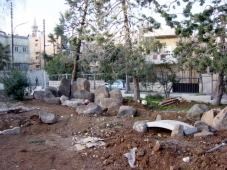 Since then, collaboration work between Japan and Jordan started and a JICA volunteer, Mr. Masamichi Ozaki, who works for the Petra Region Authority as a landscape designer, volunteered to design the garden and supervise its construction. “The Japanese garden, a symbol of friendship between Japan and Jordan , is an artistic work to express the beauty of nature in a small area”, Mr. Ozaki said. “In this point of view, I arranged Jordanian rocks and trees in the garden in order to exhibit the nature of Jordan in a different way. 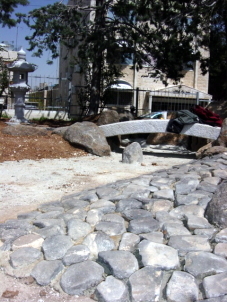 I put a water flow in the center of the garden and placed a stone bridge, which was brought from Japan ”, Mr. Ozaki added. The garden has very authentic style and almost only Jordanian materials were used in its construction. A few exceptions to the materials are the stone bridge and the lantern which were donated by the Japan-Jordan Association in Japan and shipped for free from Japan to Aqaba by the Nippon Jordan Fertilizer Company, the first and biggest joint venture company between Japan and Jordan . The reason why the Japanese garden was chosen to be part of the National Gallery Complex is its uniqueness from an artistic point of view and its consumption of less water. Both the governmental and private sectors along with the Royal Society for Fine Arts and the Greater Amman Municipality provided full support to the establishment of the Japanese garden.